If you have a big car, buying anything is a breeze. You have more room space for groceries, stroller and what-nots, all together (we even know some who pack their swing/cradle and playard! ), AND you certainly do not have to worry about your car seat not being able to fit in your car. Small car owners, you know the struggle - how many times have you bought a car seat online, only to have to return it later because it doesn't fit in your car? It doesn't help that most car seats only show their height and weight limits and and not their exact size dimensions! And lets not get into rear-facing car seat in a small car. The extra space and approved safety angle to adhere to often means you are left with not much space to even fit yourself in the front seats. We have now come up with a list of the best car seats for small cars to make your car seat buying experience a less painful one. With these, you no longer have to contemplate upsizing your car. They are mostly convertible ones, and if you don't know what these are, we have put together a short explanation for you below. 1. What is A Convertible Car Seat? To put it very simply, a convertible car seat is one that allows you to convert from rear-facing to forward-facing. If you do not already know, babies start from rear-facing before switching to forward-facing when they grow older. There's a more detailed explanation guideline below, so definitely check that out if you want to learn more about this. Convenience - Like we said, you just need to buy once and that's it. From infant to toddler, there is no need for multiple car seats at different ages. Value - Convertible car seats grow with your child until he doesn't need one anymore. Versatility - Some include a booster seat for school-age children which again, is a true value of your investment. Let us now look at what is the best convertible car seat for small cars in the market. If you like the idea of one convertible car seat from infant until the last day a child seat is required, then the Graco 4ever All-in-One Convertible Car Seat is the best combination car seat for you. 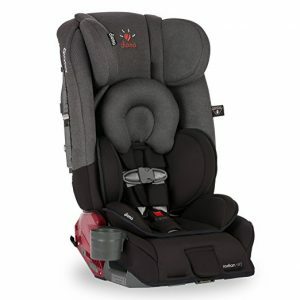 Truly an all-in-one, this car seat gives you 10 years of use from 4 to 120 pounds in four modes - infant rear-facing, toddler front-facing, booster seat in high back and backless belt-positioning mode. We especially like the 10-position headrest and easily adjustable harness system. For an all-in-one, Graco 4ever is surprisingly small at 20" wide, 24" tall and 21.5" front to back. This will definitely fit in most small cars, although we don't think it is one of those fit-3-across type because you will need something narrower for that. For one that holds up to 120lbs, Graco 4ever weighs 23lbs only. While this is certainly not light, we know there are other models that are much heavier, but with a lower weight capacity. Nonetheless, it is one of the best booster car seat because not many offers a weight limitation of up to 120lbs. Nonetheless, Graco 4ever is not meant for portability (there are other car seats meant for that) because of its weight. Once it is installed in your car, you will want to treat it as a permanent feature of your car, and you should, since it will last you 10 years! We especially like the 10-position headrest and easily adjustable harness system that the Graco 4ever provides. Graco has many other different models but in terms of choosing the best Graco convertible car seat, we think the 4ever All-in-One is the best rated convertible car seat because with this one, you truly do not need any other attachments/add-ons to last you a good old ten years! Looking for the best budget convertible car seat? Evenflo Tribute LX Convertible Car Seat will delight you! This convertible car seat has a width of 18.5" only, making it one of the best convertible car seat for compact car. Weighing at 9.1lbs only, this is also the best lightweight car seat that you can move around from car to car without straining the muscles. Because it's so light, parents have commended it being the best travel car seat. 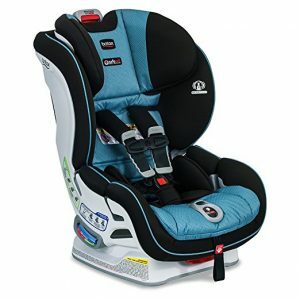 Nonetheless, it also means that it is not packed with too many add-ons or cushioning, and you may find your little one sort of swimming in the seat if s/he is on the smaller side because the harness lacks the additional padding. Don't get us wrong, there is nothing wrong with the cushioning of this car seat, it is just that most other brands provide additional ones to give better support (which is also reflected in their prices). Given the price of the Evenflo Tribute LX, you can easily solve this by buying one of these bestsellers to wrap around the harness and it will still be cheaper than other car seats. Price aside, the quality of this car seat will exceed your expectation. 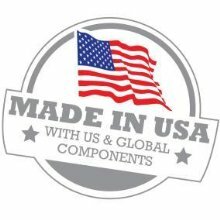 Made in the USA, it meets all standard safety requirements (and more) as it is designed and tested for structural integrity at energy levels almost 2x the Federal crash test standard. 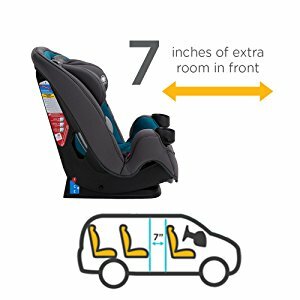 This car seat is reclinable for rear-facing use, but you do have to adhere to the weight requirements of 5-40lbs and it mostly fits babies age 18 months or below. All in all, for what you pay for, the Evenflo Tribute LX Convertible Car Seat meets all requirements and more. Not only is it the best cheap convertible car seat, it is also the best value convertible car seat that you will not regret buying. Remember we mentioned in the beginning of this review that the safety angle of rear-facing car seats is one of the reasons they are troublesome to fit into small cars? Chicco addresses this issue with its Next Fit Zip Convertible Car Seat. It didn't do this by making the Next Fit Zip the smallest or narrowest, although at 19" wide, it is still narrower than most average convertible car seats. Rather, it boasts a 9-position levelling system to allow for an accurate fit in a wide range of vehicles, which include smaller and compact cars. This is the only convertible seat that provides that many recline options when most only have 3 or 5. When you have that many reclining options, you can certainly find one angle that fits in your small backseat (rear-facing, on top of that) without compromising leg room in the front seat. This is the only convertible seat that provides that many recline options when most only have 3 or 5. Such adaptability is exceptional, really. It is also one of the best convertible car seat for tall babies because at 26", it is taller than most convertible car seats, making it comfortable for the taller ones. We cannot mention the Chicco Next Fit Zip without mentioning its ease of installation. It has two ride right bubble levels to show you the correct seat angle in both rear-facing and forward-facing modes. You won't be cursing under your breath while installing this one, we guarantee! This is definitely one of the best small convertible car seat that makes full use of every millimetre of your compact car without compromising your little one's comfort. If you are looking for the best reclining car seat , you won't go wrong with the Chicco Next Fit Zip. Best all-around champ for its combination of features and adaptability, the NextFit Zip measures 20.5 inches front-t0-back, 19 inches wide, and 26 inches tall. But it’s not that this seat is so tiny, it’s just exceptionally adaptable. Depending on whether they’re installing the seat forward- or rear-facing, and the age/weight of the child, the NextFit Zip can be installed at 9 different angles, compared to most car seats which allow only 3. When you’re rear-installing oh-so-carefully you’ll appreciate every millimeter of the NextFit Zip’s micro-adjustability; and the seat rates very highly while in use, too. Safety 1st Grow and Go 3-in-1 Convertible Car Seat is another one of the best rear facing car seat for small car that we would recommend. This convertible car seat is designed to last through all your firsts with your child. 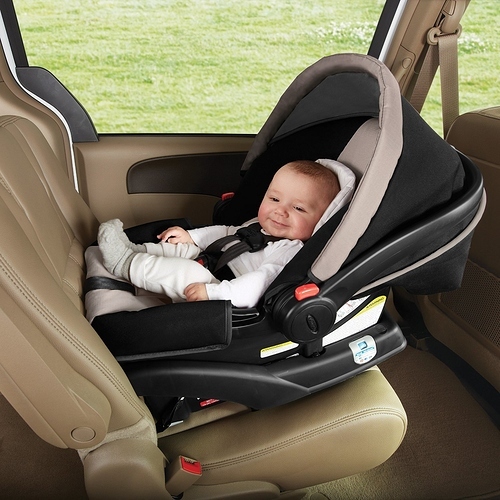 Featuring extended use at each stage, you get three modes with this car seat - rear-facing from 5-40 pounds, forward-facing from 22-65 pounds and belt-positioning booster to up to 100 pounds. Similar to Chicco Next Fit Zip, this is for those who find that they have to compromise the front seat's leg room. 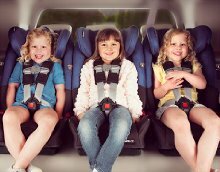 The Grow and Go is designed to prevent this by allowing up to 7" of extra leg room for parents sitting in front when placed rear-facing. For the newborns, this car seat also comes with two comfortable grow-with-baby pillows to give a snug fit. Once baby outgrows them, they can be easily removed. We love the harness holders of the Grow and Go. It is designed in a way that the harness is always kept in an open position so that it's easy to get your child in and out of the seat. Both harness and headrest can also be easily adjusted in one simple step. We think this is definitely one of the best harness booster seat too when your child utilises it. Safety 1st Grow and Go is among the best 3 in 1 car seat in the market. The promise of having 7" extra leg room makes it an attractive option, definitely the best rear facing convertible car seat for small car that you can't resist! eaturing extended use at each stage, this convertible car seat is designed to last through all your firsts with your child. For newborns to growing toddlers, the Grow and Go can be used in the rear-facing position from 5-40 pounds. It includes two comfortable grow-with-baby pillows to give your new travel companion a snug fit, and they easily remove as your baby outgrows them. Diono Radian is well known for its slim fit design and its RXT All-in-One Convertible Car Seat is the best narrow convertible car seat out of all. This is another one of the best all in one convertible car seat that grows with your child from birth to booster. Unlike Graco 4ever, it does not have a backless belt-positioning mode but you do get rear-facing, forward-facing and booster mode up to 120lbs. This is pretty impressive as it will surely fit any kid through the booster years, making it one of the best rear and forward facing car seat. This is another one of the best all in one convertible car seat that grows with your child from birth to booster. Unlike Graco 4ever, it does not have a backless belt-positioning mode but you do get rear-facing, forward-facing and booster mode up to 120lbs. If you'd ask us, we still think it is among the best 3 in 1 convertible car seat in the market! This car seat measures at 16" wide (really, you cannot go any narrower than that!) which makes it the best narrow car seat that can fit 3 across in most cars, unless yours is the exceptionally compact type which even then, you will have no problem fitting 2 without feeling congested. We also like how it folds flat so that you can even carry it on your back, making it one of the best convertible car seat for travel. You will notice that the Diono Radian RXT has a taller frame than most other car seats. If you're worried it wouldn't fit in your small car, you can buy one of these to fit underneath the seat to hold it more upright (note: you can't use this for newborns). This allows it to extend its rear-facing seating ability to fit taller kids, in fact, it is one of the best rear facing toddler car seat in the market. This is ideal for those that would like to have their kids rear face for as long as possible. We think it's worth paying the few extra bucks to extend the rear-facing benchmark reliably, given all the benefits of rear-facing. For those that are having twins or triplets, Diono Radian RXT All-in-One Convertible Car Seat is the best compact convertible car seat to get because you can pack them side-by-side in your car, and they take you from newborn to booster seat age seamlessly. If you're worried the tall frame wouldn't fit in your small car, you can buy one of these to fit underneath the seat to hold it more upright. If the Diono Radian RXT is out of your budget, don't worry, we've got an alternative fit-3-across in Safety 1st Guide 65 Convertible Car Seat that is under $100. Its 18" width, 20" front-to-back dimension allows you to place three of them side-by-side in most vehicles. While it is not as narrow as the Diono Radian RXT, it should still fit in most compact cars. The Guide 65 is one of the best extended rear facing car seat because it allows up to 40 pounds and 40 inches rear-facing, as well as 65 pounds and 52 inches forward-facing. The multi-position adjustable head rest ensures it grows with your children. 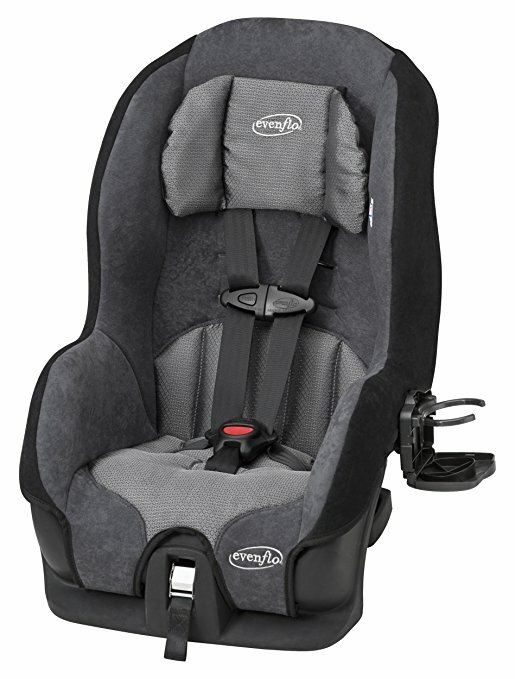 This car seat is comparable to Evenflo Tribute LX in that they are both very affordable and lightweight, making them good options for travelling but the Safety 1st Guide 65 is 0.5" narrower, which makes it the Diono Radian in a simpler version, but not as expensive. But its height-and-weight limits are much higher than the Coccoro: 40 pounds and 40 inches rear-facing (leading us to dub the Guide 65 one of our best best for extended rear-facing under $100) and 65 pounds and 52 inches forward-facing. While most car seats cater to accommodate newborns, not all provide the best fit/comfort, especially if your baby is on the small side. If this is your situation and you're looking for best infant car seat to fit into your small car, Maxi-Cosi Pria 70 is your answer. This convertible car seat is designed to provide the right fit for any size of infant to 7 years of age. This is thanks to the brand's removable infant insert that is made from plush premium fabrics with the ability to deodorise and draw liquids away from the skin to keep your baby dry and comfortable. This insert makes sure your baby is tuck in snugly so that s/he will not 'swim' around in it. Parents with small babies and even preemies have raved about how well the Pria 70 is in terms of fitting their little one snugly and comfortably. Not too wide at 19.5 inches, the Pria 70's 21 inches front-to-back dimension makes it the best compact infant car seat. The deep recline adjustment system makes it easier and faster to correctly install in rear-facing position as it gives you more options to find the best fit for your compact car. 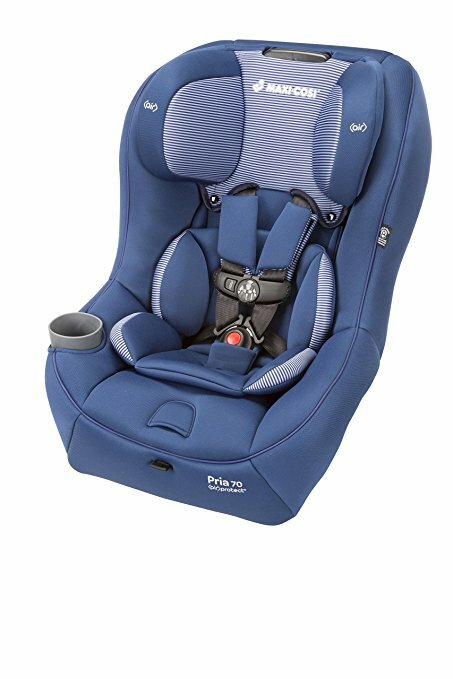 In terms of providing the ultimate comfort seating area for baby, the Maxi-Cosi Pria 70 is the best infant car seat for compact car for that. There is no baby too small for the car seat with this one! 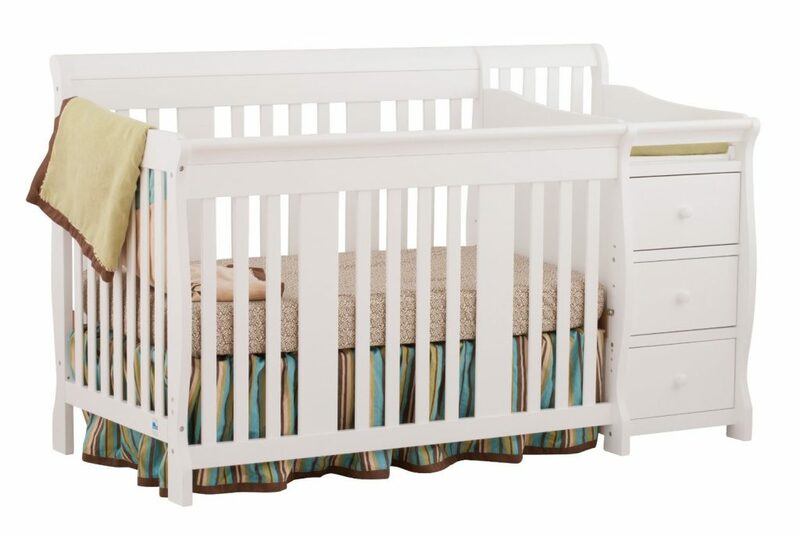 Parents with small babies and even preemies have raved about how well the Maxi-Cosi Pria 70 is in terms of fitting their little one snugly and comfortably. Ah, Britax. 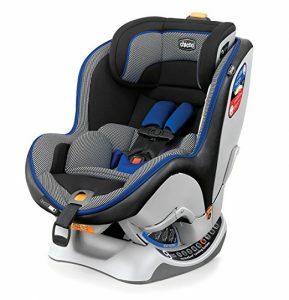 This brand has manufactured different models of car seats and there are many Britax convertible car seat reviews floating around which naturally, will get you asking: which is the best Britax convertible car seat? Not just that, but the best to fit in compact cars? The answer is - Britax Boulevard ClickTight Convertible Car Seat. For all the extra padding and protection (which we will talk about shortly) it provides, you will be pleasantly surprised to find that it is not too wide, in fact, just 18.5 inches which you should have no trouble fitting in your small car. This is the car seat to go for if you want assurance in the safety department. It has 2 layers of side impact protection that are formed by a deep foam-lined shell and a quick-adjust head protection to absorb energy and shield your child from the most dangerous type of collision. Add a steel frame safety system with energy-absorbing base and patented V-shaped tether on top of that, you get the most durable convertible car seat in your hands. Installation wise, the Britax Boulevard ClickTight is pretty foolproof. Its innovative Click Tight Installation System is the safest and simplest technology in the market. 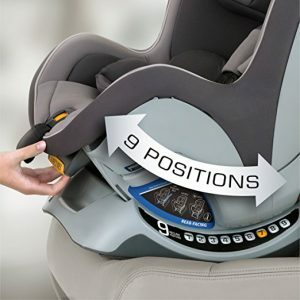 All you have to do is open the front of the car seat, feed the seatbelt through the indicated path and click the seat shut for a rock-solid installation. No fumbling around with ties and straps for half an hour! If you're looking for the best Britax car seat, the Boulevard ClickTight is the one in our opinion. But note that it is not the lightest, so this is one that you will want to treat as a permanent fixture in your car once installed. 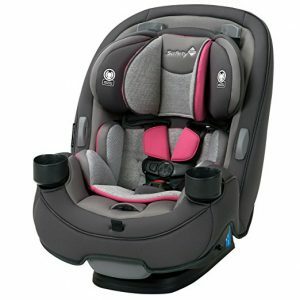 best Britax convertible car seat. Size. This is a no brainer. Given your compact car is the issue to start with, you should always first look at the size of the car seat you intend to buy. Our review above provides most of the dimensions required to give you a good gauge, though we'd recommend measuring the exact car space you have before making your purchase. Psst, if your car is really mini (we're talking about Beetle, Fiat kind of mini) and none of the above really fits, then your last option will be the Combi Coccoro Convertible Car Seat. It has the smallest dimension at just 15.5 inches wide and 18 inch front to back so it will fit in even the smallest of small car. Mind that you will have to compromise on something though, and that is weight capacity. The maximum you can go is 33 pounds (rear-facing) and 40 pounds (front-facing) so this is really for the newborns. The Combi Coccoro makes for the best infant convertible car seat for the really small and compact car. Booster. This may be your second point for consideration. How long do you intend to use your car seat? If you want your toddler to sit in one for as long as it fits, you will want to find those that can be converted into booster seat. 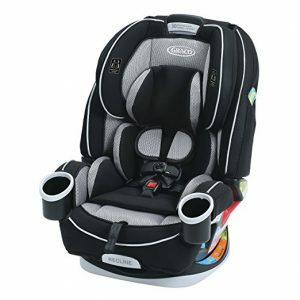 All-in-one like the Graco 4ever or 3-in-1 like the Safety 1st Grow and Go have amongst the best booster car seat that make them the best car seat for 5 year old and best car seat for 6 year old in the market. Price. Of course, you will want to buy according to your budget. If you cannot afford or do not want to spend $200-$300 on a car seat (though we'd say such price is usually justified, at least the ones we chose in our best car seat reviews above), there are a number of convertible car seats that are at a more affordable range such as the Evenflo Tribute LX Convertible and Safety 1st Guide 65, both of which are below $100. Don't worry, we have already filtered out the inferrer ones so you can have peace of mind that these car seats are good in quality, without breaking the bank. Installation easeness. Do not underestimate this in your consideration factors. A car seat that is difficult to install is actually a hindrance to many parents. Lucky for you, we have done the hard work of eliminating the impossible ones, leaving only the easy-to-install in the above recommendations for you to choose from (this particular one from Britax is really the champion out of all). Safety features. This is probably the least you have to worry about because while most car seats are already designed with safety in mind, you can be certain that the ones we reviewed and recommended above have definitely met the standard safety requirements and beyond for you to shop with peace of mind. Have you ever wondered why some car seats face the front, while some others are rear facing? They are not just for aesthetic or your preference or convenience, but they serve one very important reason - safety. Rear-facing car seats are mandated for newborns and infants because they provide the best support to a child's head, neck and spine, which are still quite soft as they are still developing. They prevent your child's head from being thrown away from his body in the event of any sudden stop or worse, a car crash. It is only when they grow older that parents switch to a front-facing car seat. Now you know why rear-facing car seats are so popular! In the past, many parents usually switch their children to forward facing when they reach 1 year of age. However, new guidelines in 2013 mandate children to sit rear-facing until they are 15 months old. Even more recent is that both the AAP and the National Highway Traffic Safety Administration (NHTSA) recommend children to face backward until they outgrow their seat. This means most children should remain in a rear-facing car seat until they are at least 2 or 3 years old. When forward-facing, it is recommended that children use the built-in harness system of the car seat for as long as possible until even the forward-facing weight/height is outgrown. If you think that's it, your child is ready to sit in the normal seat with seatbelt on, you are wrong. Authorities have advised that children should ride in a belt-positioning booster seat for ultimate safety until they reach at least 4 feet 9 inches tall. This is why you should try to look for car seats with the biggest weight and height limitation, like this and this. 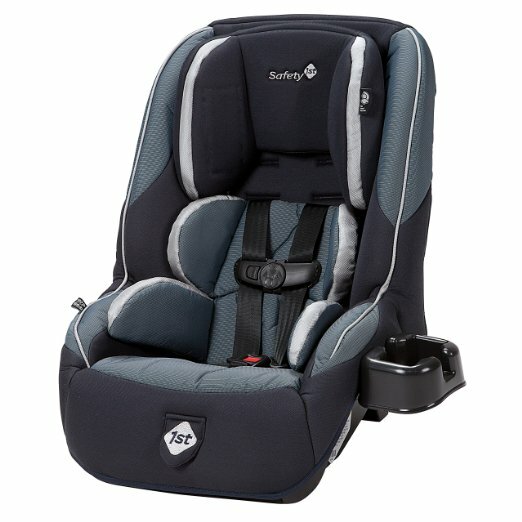 So even though most 4-in-1 are pricier than other car seats, we think they are well worth it because like the Graco 4ever, it really lasts you forever (well, at least 10 years) from infant to toddler hood. The day you remove it completely off from your car is the day your child truly doesn't need one anymore. The American Academy of Pediatricians (AAP) and National Highway Safety Administration (NHTSA) recommend that children ride rear facing until the age of 2 or until they reach the maximum rear-facing height or weight rating for their seat, and when forward-facing, children should use the built-in harness system for as long as possible until they reach the maximum forward-facing weight or height for their car seat. After reaching the maximum forward-facing weight and height, they also recommend that children 4 feet 9 inches tall or under should ride in a belt-positioning booster seat. Help! Which stroller should I get for my twins? Small car owners, you know the struggle - how many times have you bought a car seat online, only to have to return it later because it doesn't fit in your car? If you're looking to buy a car seat that fits perfectly in your small car, look no further - find the best car seat deals for this Black Friday or Cyber Monday!